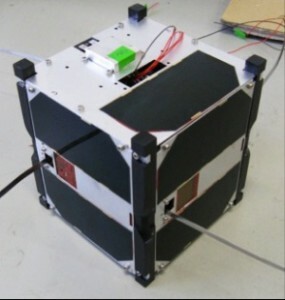 The miniature satellite has to support not only the aim of teaching and education, two scientific mission objectives: Firstly, to the atomic oxygen in the residual atmosphere (between 400 and 600 kilometers) can be measured. Furthermore, it forms a technology demonstrator for advanced thin film solar cells. All exterior surfaces, unless occupied by the payload, will be equipped with solar cells. Thus an available solar cells area of 0.03 m² is reached. The solar cells are the only source of energy. For intermediate storage of electric energy Li-ion batteries are used. For the operation of the spacecraft and the payload are less than 2W available. Inside of the satellite located on the electronics of the four boards distributed payload of the communication system, the main controller, the power supply and the position control. Between the symmetrically arranged circuit boards, the accumulators are placed. A permanent and targeted at certain orientations of the satellite attitude control is not provided. Instead, the concept is limited to the determination of the location and position of the satellite and to the provision of an adequate “wobbling” of the satellite. Receiving the Morse beacon: When operational SOMP sends every 1 minute a Morse beacon. Every third period with 12 wpm. The others are sent with 240 wpm. The transmitted text consists of 3 words with 19 characters, with the following structure: DP0TUD AAA BBBBBBBB. With a program that is available via the website, the received characters can be decoded, or one can alternatively, download a Java application that is available for download. Deployed and Active. Will be launched by a Soyuz 2.1a from Plesetsk SC on April 20, 2013. Orbit will be 575 km circular at 63° inclination.